Looking for cognitive skills games that get kids up and moving? You’ve come to the right place! This Valentine’s Day game challenges motor and cognitive skills at the same time and can be adapted to target a variety of skills and concepts. We did the activity with a Valentines Day theme, but you could substitute the hearts and pink paper with Christmas trees cut out of holiday-themed paper, or you could make the cutouts look like letters in envelopes for a fun “mailman” activity with preschoolers during a Community Helpers unit. WHAT TO DO: Cut a swatch from each of your different types of craft paper and affix one to the top of each box. Then, cut out several 3” hearts from one of your sheets of craft paper. On the back of the hearts, spell out a familiar word – one letter on each heart – so you have to put a few hearts together to make the word. You could use sight/spelling words, your child’s name, or for older kids you could even spell out a short sentence or phrase like “I love you”. Move on to the next two types of craft paper and do the same thing (a different word, name, or phrase with each type of paper). Now the fun begins! 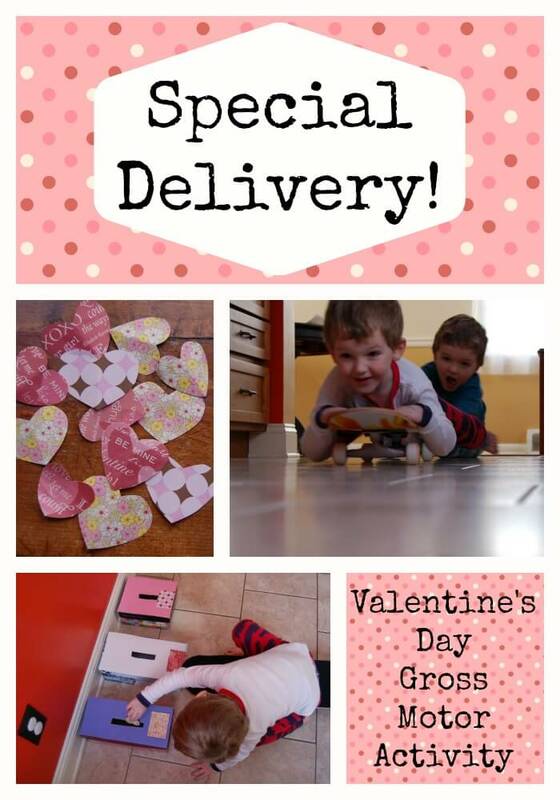 Tell your child that he needs to make special Valentine’s Day deliveries to each of the three mailboxes. He’ll move from a starting point (see below for variations on how to move) to deliver each heart into the mailbox with the matching swatch of craft paper. Once all of the hearts have been delivered, have him dump the boxes (one at a time) and figure out how to sequence the letters properly to make the word, name, or phrase. -For awesome work on posture, strengthening, and trunk stability, position the child on his tummy on a scooter or skateboard and tell him to lift his arms and legs up as high as he can off the ground. Give him a push to send him flying like Superman to deliver his hearts! -Try a variety of movements to get to the mailboxes: crab walk, log roll, hop, jump, skip, etc. -Put numbers on the backs of the hearts instead of letters and have the child put them in the correct sequence. -You can write several words on each type of craft paper, clipping the hearts for each word together, so you can play multiple rounds! Want to take a closer look at the skills kids are using in this activity? Check out our Clinical Closeup page, where we break down the skills listed below in terms everyone can understand. This is awesome in so many ways! My 3 1/2 is seriously obsessed with playing “mail” right now. I love the variations you came up with and I like the matching aspect. Love it! 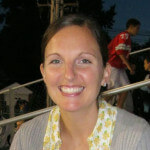 Hi there…we did a site redesign this week so the images may have been loading slow, or not at all, during that time. Hoping things are better for you now? !